Digital transformation and next-generation computing technologies are providing solutions to the massive water and wastewater infrastructure problems that continue to handicap utilities in their ongoing battle to fix leaks, upgrade piping networks and reduce nonrevenue water losses. There are an estimated 240,000 water main breaks per year in the US, wasting over two trillion gallons of treated drinking water. On average, severe water leaks cause $200,000 worth of infrastructure damage per incident. The American Water Works Association estimates that the cost of restoring underground pipes in America will total at least $1 trillion over the next 25 years. ARC has just published our market analysis report for the SCADA for water and wastewater market for 2018, and in this blog, we highlight some of the digital transformation trends that go beyond the scope. For more information and to inquire about purchasing, contact Rob D’Angelo, Director of Strategic Services. The cost of processing power, the standardization of algorithms, and the volume of available data have converged and made AI an effective tool being implemented across all industries. For water utilities, asset management and the aging infrastructure of their pipeline networks is a pervasive issue across the developed world. As intelligence keeps improving and smart water networks collect more data, artificial intelligence is finding its place in a market that is typically slow to adopt the latest technologies. AI and machine learning are perfect tools for pooling the data from a water utility and then providing actionable intelligence from analysis of that data. AI is the solution to handling this vast volume of data and using it to identify and prioritize where limited capital and human resources are invested. Fracta and plutoshift are two emerging vendors bringing AI solutions to the water and wastewater industry. Fracta’s SaaS solution is targeting the massive problem of condition assessment of drinking water pipeline networks. Its solution has the capability for leak detection and data-modeling the prioritization of pipe replacement based on their algorithm for pipes likelihood-of-failure (LOF). 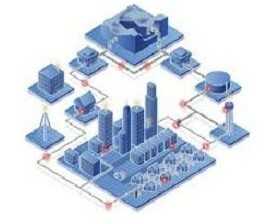 Fracta is built on the ESRI platform, which provides maps of distribution pipe networks and integrates critical data such as pipeline break history, SCADA network data, environmental information (such as soil sensor data), population density, and climate data to provide a complete assessment of the LOF of the utility’s entire distribution pipeline network. When the utility is empowered with Fracta’s intelligence, asset management is aided by an accurate and optimized decision support system powered by AI. For a broader solution, utilities are turning to plutoshift for comprehensive performance monitoring, which provides real-time intelligence to manage and predict key cost drivers and resources for industrial asset management. Plutoshift’s AI algorithms provide analysis of asset parameters, identify hidden correlations, predict their impact on financial metrics, and provide insights that are relevant to the utility’s workflow. Plutoshift aggregates and analyzes SCADA data and provides operators with simple dashboards and AI-powered insights so they can make more informed decisions using visualizations of data relationships across silos. Traditionally, leak detection is accomplished by deploying a network of sensors along pipe networks. Watchtower Robotics is revolutionizing leak detection and providing utilities with the capability to deploy a robot to assess and model their complete network infrastructure with exceptional accuracy and intelligence. The robot works for all pipe materials and provides water and wastewater utilities with a level of network infrastructure intelligence beyond previous technologies capability. While mapping your network in 3 dimensions, the robot can spot leaks as small as 1 gallon per minute to a location accuracy of 1 foot. Watchtower’s patented robot is providing utilities with a comprehensive understanding of their networks, and it is doing it at 1/10th the cost and 5 times the speed of standard leak detection systems. This innovative robotic solution has finally made it cost effective and a necessity for water utilities to have real intelligence of the health of their entire pipeline infrastructure. Cities can now employ prescriptive maintenance and prevent their highest cost incidents including pipe bursts and erosion leading to sinkholes; This enables greater optimization of limited resources for capital improvements and maintenance. Historically, meter vendors required significant investment in communications infrastructure to build AMI networks, which gathered data over proprietary networks. With the deployment of LPWAN infrastructure all over the globe at a rapid pace in recent years, some meter vendors are responding by beginning to offer meters capable of connecting to these available networks which align well with data transfer needs of water meters. This can allow utilities to focus their available resources on deploying smart meters and implementing software solutions to use the data to identify and solve problems that increase revenue by lowering nonrevenue losses and increasing customer satisfaction. Neptune Technology Group offers smart water meters with open IoT communications technology for AMI networks for smart cities. Neptune’s R900 meter interface unit can be deployed with a Network-as-a-Service infrastructure using LoRaWAN technology and is Neptune’s solution to support smart city initiatives. In 2017 WaterGroup signed a 5-year partnership with Thinxtra to connect its meters to SigFox’s LPWAN. WAVIoT also is offering smart plug-and-play water meters that are LPWAN-enabled off-the-shelf IoT ready products for smart cities.